A quick spin through composer/performer Xuan Ye's website affirms her very broad and ever-changing approach to audio and visual expression. 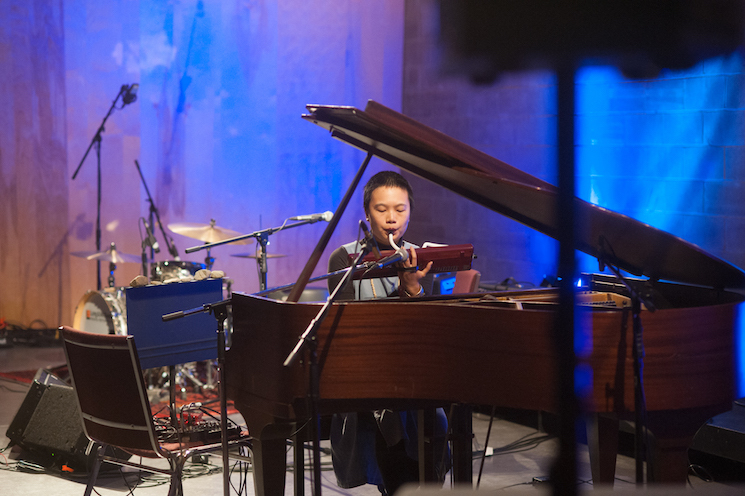 For this evening, the Toronto/China-based artist began with fairly rudimentary elements — a stark and clear-voiced chant plus a minimal prepared piano — that suggested we were in for a mildly hybridized but traditional performance. Soon enough this presumption was derailed as she turned the microphone into a sound-gathering spade of sorts, digging around the inside of the piano and looping the results she found. After slightly muting her cacophonous discoveries, the soundscape was used as a backdrop for brief melodica and piano overlay, including further filling the resonant strings with metallic objects. The experience was captivatingly gestural, maximizing the very minimal musical elements that she chose to deploy. Concluding with a return to the traditional chant, now in the form of quietly strangled cries, Xuan suggested a sort of derangement of tradition, or struggle for its survival. While the artfulness drew strength from simplicity, the show seemed to be missing a key middle section where the tension between the poles might vibrate for a time before resolving. Nonetheless, a memorable journey.